In my never-ending strategy to educate policy makers about the Laffer Curve, I generally rely on both microeconomic theory (i.e., people respond to incentives) and real-world examples. And my favorite real-world example is what happened in the 1980s when Reagan cut the top tax rate from 70 percent to 28 percent. Critics said Reagan’s reforms would deprive the Treasury of revenue and result in rich people paying a lot less tax. So I share IRS data on annual tax revenues from those making more than $200,000 per year to show that there was actually a big increase in revenue from upper-income taxpayers. It has slowly dawned on me, though, that this may not be the best example to share if I’m trying to convince skeptical statists. After all, they presumably don’t like Reagan and they may viscerally reject my underlying point about the Laffer Curve since I’m linking it to the success of Reaganomics. So I have a new strategy for getting my leftist friends to accept the Laffer Curve. I’m instead going to link the Laffer Curve to “successful” examples of left-wing policy. To be more specific, statists like to use the power of government to control our behavior, often by imposing mandates and regulations. 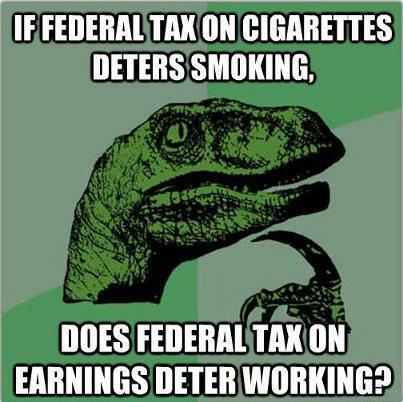 But sometimes they impose taxes on things they don’t like. And if I can use those example to teach them the basic lesson of supply-side economics (if you tax something, you get less of it), hopefully they’ll apply that lesson when contemplating higher taxes on thing they presumably do like (such as jobs, growth, competitiveness, etc). Here’s a list of “successful” leftist tax hikes that have come to my attention. The big drop in home sales after a tax was imposed in Vancouver on purchases by foreigners. The big drop in tobacco sales after a big increase in D.C.’s tobacco tax. The big drop in soda purchases after a tax was imposed in Philadelphia. Now I’m going to augment this list with an example from the United Kingdom. By way of background, there’s been a heated housing market in England, with strong demand leading to higher prices. The pro-market response is to allow more home-building, but the anti-developer crowd doesn’t like that approach, so instead a big tax on high-value homes was imposed. And as the Daily Mail reports, this statist approach has been so “successful” that the tax hike has resulted in lower tax revenues. George Osborne’s controversial tax raid on Britain’s most expensive homes has triggered a dramatic slump in stamp duty revenues. Sales of properties worth more than £1.5million fell by almost 40 per cent last year, according to analysis of Land Registry figures… This has caused the total amount of stamp duty collected by the Treasury to fall by around £440million, from £1.079billion to a possible £635.7million. The figures cover the period between April and November last year compared to the same period in 2015. Our leftist friends, who sometimes openly admit that they want higher taxes on the rich even if the government doesn’t actually collect any extra revenue, should be especially happy because the tax has made life more difficult for people with more wealth and higher incomes. Those buying a £1.5 million house faced an extra £18,750 in stamp duty. …Tory MP Jacob Rees-Mogg…described Mr Osborne’s ‘punitive’ stamp duty hikes as the ‘politics of envy’, adding that they have also failed because they have raised less money for the Treasury. By the way, the fact that the rich paid less tax last year isn’t really the point. Instead, the lesson to be learned is that a tax increase caused there to be less economic activity. So I won’t care if the tax on expensive homes brings in more money next year, but I will look to see if fewer homes are being sold compared to when this tax didn’t exist. And if my leftist friends say they don’t care if fewer expensive homes are being sold, I’ll accept they have achieved some sort of victory. But I’ll ask them to be intellectually consistent and admit that they are implementing a version of supply-side economics and that they are embracing the notion that tax rates change behavior. Once that happens, it’s hopefully just a matter of time before they recognize that it’s not a good idea to impose high tax rates on things that are unambiguously good for an economy, such as work, saving, investment, and entrepreneurship. P.S. In addition to theory and real-world examples, my other favorite way of convincing people about the Laffer Curve is to share the poll showing that only 15 percent of certified public accountants agree with the leftist view that taxes have no impact have taxable income. I figure that CPAs are a very credible source since they actually do tax returns and have an inside view of how behavior changes in response to tax policy. on February 27, 2017 at 1:28 am Ann in L.A. The soak-the-rich yacht tax is another good one to point to. Probably an example from the Kennedy inspired tax cuts would meet with a more favorable response from the libs. A lesson in retail sales economics may also be appropriate. Raising prices does not necessarily lead to increasing profits; if fact the reverse may be true, even to the point of closing the store if you price yourself out of the market. Rather, the store owner must balance prices with volume to maximize profits. So with taxes, tax rates and tax revenue are two entirely different things – hence the Laffer Curve.